Living Online: Book Concert And Hotel In U.K.
Book Concert And Hotel In U.K. I am always interesting about someone create new website or new service. Something looks very simple but concept is great. 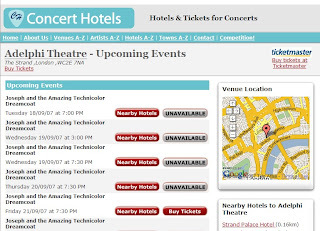 Concert Hotels is a new website, and that offers information about concert, hotel, or other events in U.K. If you live in European country you can book ticket for concert and hotel in U.K with that website, maybe it will extend service to whole Europe in the future. I think that is a great idea. I like concert, but if I need drive 5 or 6 hours back home after concert maybe I do not want to go. If I book tickets and hotel room that would be difference.